Time to take the snow tires off and get ready to race on the pavement!! With the beginning of warmer weather comes the beginning of Auto Slalom!! First race of the year is scheduled for May 5th in the Dominion Motors Parking Lot. If you need more information, or a membership, contact a member of the Executive or visit www.iceracingthunderbay.com !. Sorry for keeping eveyone in the dark for so long about this years events it still coming together. Can we expect any possibility of dates for the auditorium? There is a general meeting tonight. 7 at the da vinci. Everyone is welcome. Cool.. I'd definitely come out to watch, hoping to get an FC track whore for next year. List of dates for the year yet ? Edit... Found them. Only four ?!? On a positive note..20Specv12 it's always nice to see new faces & so glad your looking to come out and race! !Should be a blast! Last edited by Kattty; 05-02-2013 at 10:59 AM. From what I can recall the Auditorium parking lot is full of huge pot holes now... is that why? Yes the auditorium lot is in rough shape. Anyone know of any other lots to go look at? What about that large parking lot behind the Arthur st Tim's? They had some sort of vintage auto slalom there last year didn't they ? Left of famous players parking lot? Huge and from what I remember not bad, but I havent been there in a while. 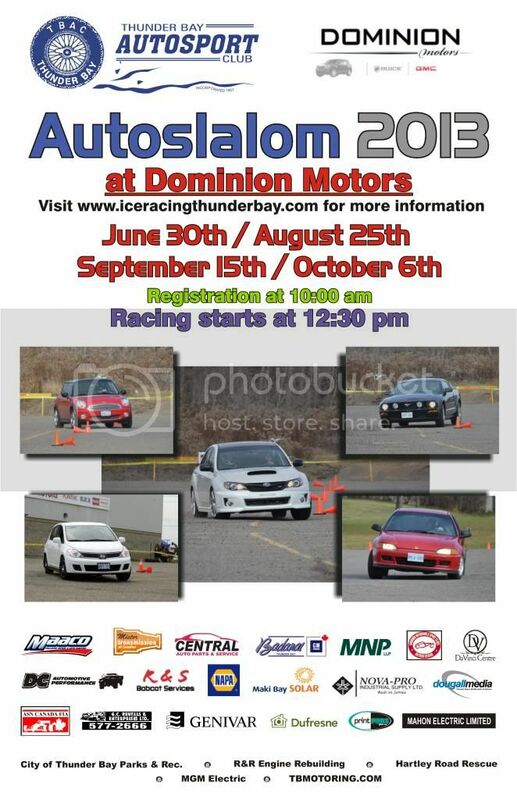 Reminder to everyone that tomorrow is the 1st Autoslalom of 2013. It will be held at Dominion Motors lot. There are two classes now, I believe they are above 300 tread wear tires and below 300 tread wear.